Every establishment in which 20 or more employees are working ( whether employeed directly or through contractor ) shall comply the Employees Provident Fund (EPF) Scheme under The Employees’ Provident Funds and Miscellaneous Provisions Act, 1952. Equal Amount is i.e. 12% of Basic ( Include DA & retaning earnings if any) by Employer's. Out this 12% of employers contribution, 8.33% diverted to Employees Pension Scheme (EPS) and 0.5% towards Employees' Deposit linked Insurance (EDLI) and balacne towards EPF. In certain specified cases as applicable to industry EPF contribution rate apply 10% in both Employee and employer case. AS PROPOSED IN THE BUDGET 2018, Contribution from women employees towards their provident fund shall be 8% instead of 12%, for three years. However, employers’ contribution would still be 12% towards EPF contribution and shall subject to full reimbursement by the Government as proposed. Enrolment of all eligible employees on its rolls (regular or contractual) – wages upto Rs 15,000 at the time of joining the establishment. Generate UAN for new employee and upload KYC information. Employer contributes 12% of salary ( Basic +DA+ Retaining allowance) and an equal % deducted from employee's salary as an employee contribution part per month and deposit with EPF Account within the due date. Every month Employer file PR return online with details of Employee, salary and PF contribution amount within the due date. Challan generates online based on return uploaded,. The employer may choose to make the payment through internet banking of SBI or take a print out of the Challan and pay at any designated branch of State Bank of India (SBI). Verify and confirm that all employees have KYC (Aadhaar, Bank Account, PAN) compliant UAN (Universal Account Number). Confirm remittance status of contractual employees belonging to an EPF registered establishment before releasing payment to such contractors. Payroll - Wage record and books of Account, Employee Attendance Register to be maintained under other laws. It is suggestible preserve records for atleast 7-10 years. As soon as your documents reach to us and your application is processed properly, we start processing your PF Registration and submit to Authority. Our expert will provide the PF registration number for your business and the 12 digit UAN number for your employees within 4-7 days. Before starts preparing OLRE application, ensure you have PAN in the of entity, Registration certificate/license and address proof. Filled up the application carefully, as after submission Edit option is not available. . You have option to save Application with partially filled up. Once Application fill up is complete and Saved, next work is upload all relevent documents and attach DSC of the employer. Finally submit the form and get acknowledgment receipt. As per Act, Wages/Salary implies and includes Basic + Dearness Allowances and retaining allowances. 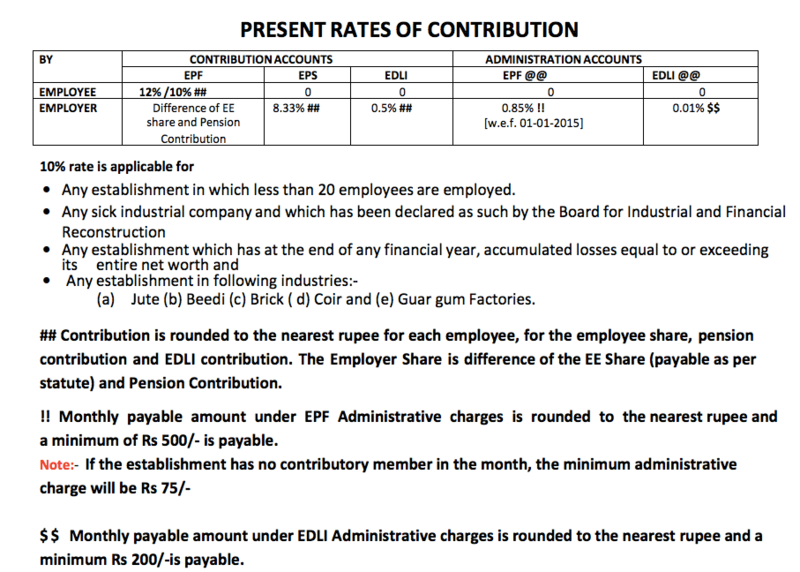 EPF Contribution by Employee 12% of salary and equal amount *12% is also contributed by employer. The employee can voluntarily pay higher contribution above the statutory rate of 12% of salary This is called contribution towards Voluntary Provident Fund (VPF) which is accounted for separately. This VPF also earns tax-free interest. However, the employer does not have to match such voluntary contribution. certain other conditions, as per the EPFO rules, the contribution rate for both employee and the employer is limited to 10%. Separate Login:- A separate Establishment login is provided, so that the Owner need not himself be involved for the remittance and can get it delegated to any authorized person to do the routine activities. PF Deposit and File Return date: Employer shall deposit monthly PF by 15th of following month and file Monthly Return online by 25th of following month and Yearly Return by 25th April. What is the full form of UAN number? Full form of UAN is Universal Account Number. UAN is allotted by EPFO. UAN can be used anywhere in India. The employee can track and check the EPF balance against his EPF account. Every EPF member is given a UAN number and EPF member ID with first employment. The UAN does not change with the change of job. This portable number helps the employee to transfer the PF balance while changing the job. The PF member ID changes with every job. It is given by the employer. What do you mean by salary for this purpose? How PF is calculated on salary? What if EPF registration is not done? As per the Rule within one month of EPF Scheme applicability on employer, it is the legal obligation of the employer to get register with EPFO and open and EPF account (UAN) of all employees drawing monthly salary upto RS 15,000. Is Permanent Account Number compulsory for Registration of EPF? Is Digital Signature of Employer is Mandatory in EPF Registration and Return Filing? Yes. Class 2 DSC required of employer and to be register before filing registration application of registration and and in all return filing. For PF deduction, the maximum limit of salary of the employee is Rs 15,000 per month. This means that even if the employee's salary is above Rs 15,000, the employer is liable to contribute only on Rs 15,000 that is Rs 1,800. What is a Employee Provident Fund (EPF) account? EPF is a part of your salary, which is deducted every month from your salary and deposited the same on your behalf by employer. If you work in an establishment having 20 or more employees and your salary is upto Rs 15,000, then the employer pays the same amount as it is deducted from your account and when you leave the firm you can apply and withdraw the amount saved. What are the penal provisions in the EPF & MP Act 1952 for non compliance of Employer and Employee contribution? 2) Attachment of moveable and immovable properties. 3) Arrest and detention in Prison.. Action under section 406/409 of the Indian Penal Code[ Criminal Law] and Section 110 of Cr .P.C Prosecution. 4) Prosecution for Non payment of contributions normally end in favour of the Department.Mandatory punishment of detention in Prison is provided . No. As per the provisions of the EPF & MP Act 1952, Act, no eligible employee has the option of staying away from the contribution. It is mandatory to contribute to the fund, if the establishment and employee both are coming under the provisions of the Act. What are the benefits of EPF contribution to employees? Employee Provident Fund is a very important investment for the necessities of our future. The contribution towards the fund is eligible for tax deduction u/s 80C of Income tax Act. The interest and maturity value received from EPF is also exempt from tax. Secondly, Partial withdrawals are allowed for specific expenses such as house construction, higher education, marriage, illness etc. As part of the scheme, the employees are eligible for pension upon retirement. "An establishment which had more than 20 employees at the time of registration but later reduced to 10 employees". EPF Scheme shall still Apply? Yes. Any establishment which has been covered under the Act once shall continue to be governed by the Act even if the number of persons employed therein at any time falls below 20. Is a trainee or Apprentice an employee under the Act? A trainee is considered as an employee as per the Act. But in case the trainee is an apprentice under the Apprentice’s Act then he/ she will not be considered as an employee under this Act. I run a partnership firm with 30 employees. Should I register with EPFO? Yes. Irrespective of type of organisation (except the exempt categories) be it proprietorship, partnership firm, LLP or company, etc., if the number of employees exceed 20 during any time of the financial year, registration with EPFO is mandatory. Can an employee opt out of EPF scheme? 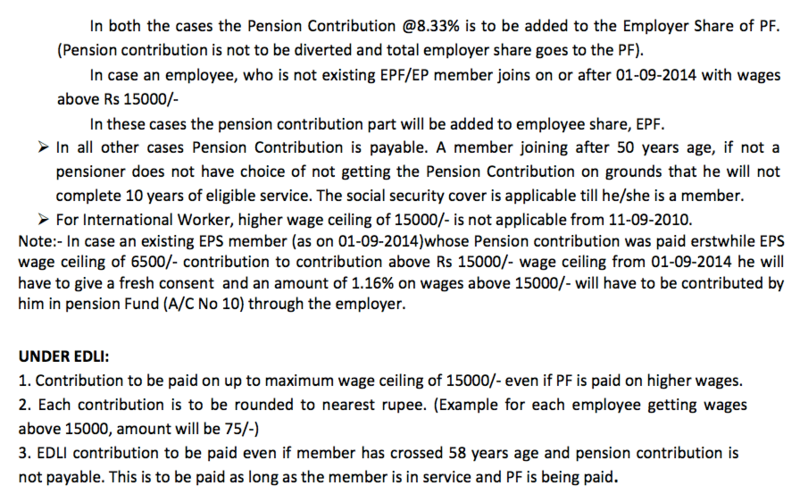 Yes, as employee can opt out of EPF scheme if his/her monthly salary (basic+DA+retaining allowance) is more than 15,000, but the employee have to decide it before becoming the member of EPF. Once the employee become a PF member, he/she can’t leave it till in the job. Can an Employer legally deduct his own contribution from the salary of Employee? 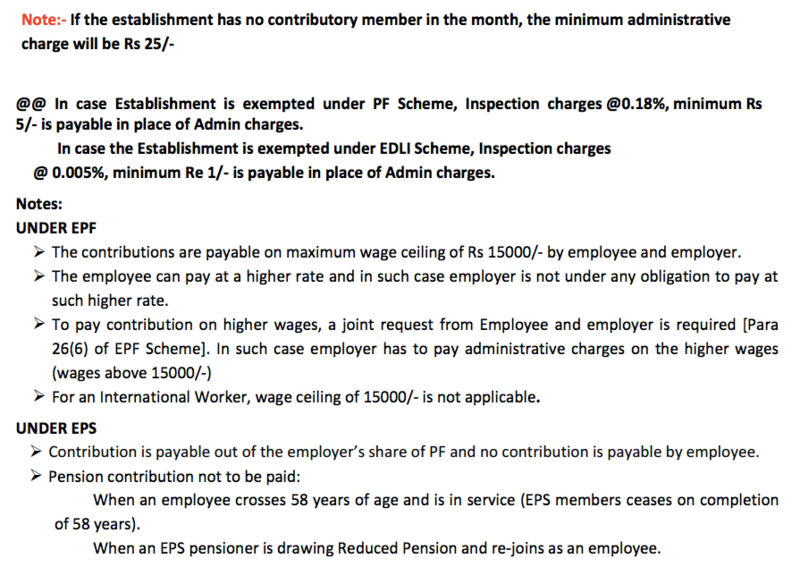 According to EPF rules, an employer can’t deduct his contribution part from employee salary. It is illegal. What is the employee strength in EPF Applicability for a Co-operative societies? Co-operative societies are expected to register if their employee strength increases to 50 or more and registered organisations continue to be under the purview of the rules and regulations of the Act even if their employee strength falls below the minimum specified number. What is the Concept of Employees Provident Fund behind its applicability started in India? A provident fund is created to provide financial stability and security to the working class. An employee begins contributing to this fund on a monthly basis when he/she starts out as an employee. The purpose of an EPF is to help employees save a part of their salary every month to be used when the employee is no longer fit to carry on working, i.e., when the employee has to retire from service, or terminated, or is retrenched for any valid reasons. CONTRIBUTION MEANS A CONTRIBUTION PAYABLE IN RESPECT OF A MEMBER UNDER A SCHEME OR THE CONTRIBUTION PAYABLE IN RESPECT OF AN EMPLOYEE TO WHOM THE INSURANCE SCHEME APPLIES. Therefore, both the employer and employee contributes to the Employees Provident Fund at a rate of 12% of the basic salary and dearness allowance (if any) every month. This fund is maintained and overseen by the Employees Provident Fund Organisation of India (EPFO). Any company with over 20 employees is required by law to register with the EPFO which is the authority made under the said Act to check the correct implementation of the Act.